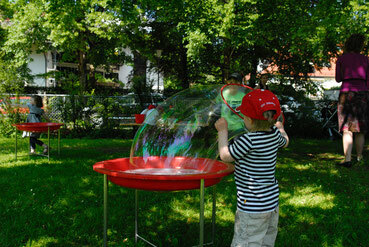 We are a bilingual preschool with 30 places in an old suburban villa with a large garden. Our curriculum is based on the philosophy of Maria Montessori and the concept of intercultural education. The warm and comfortable atmosphere in the preschool, provides the children with a strong sense of security and familiarity whilst also creating the supportive environment which all children need to grow and develop. The teachers see themselves as sensitive observers, who at the right moment will intervene, clarify and support a child as needed. They also see it as very important to encourage good relationships between the children themselves. This is possible because of a very high child-teacher ratio and the importance which we place on good teamwork and cooperation. It is considered a wonderful gift for a child to be able to learn a second language simply as they play and go about their daily kindergarten routine. It is our belief that encouragement in this learning process is vitally important – but even more so, that laughter and enjoyment play an integral part in its success. 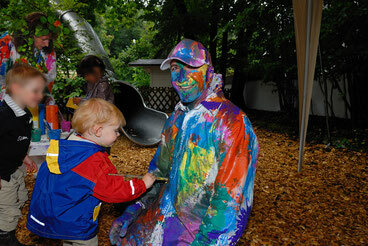 This element of fun is encouraged through interaction with nature, sport, field trips and a variety of projects.